Mainly based upon Imam AbdurRahman Al-Sadi’s explanation, which can be used as study aid while listening to the series. In addition, Dawud Burbank rahimahullaah also explains some Points from Shaykh Uthaymeen and other Imaams as well. وعن أبي سعيد الخدري رضي الله عنه عن رسول الله صلى الله عليه وسلم قال: (قال موسى: يا رب، علمني شيئاً أذكرك وأدعوك به. قال: يا موسى: قل لا إله إلا الله. قال: يا رب كل عبادك يقولون هذا. قال: يا موسى، لو أن السموات السبع وعامرهن غيري، والأرضين السبع في كفة، ولا إله الله في كفة، مالت بهن لا إله الله) [رواه ابن حبان، والحاكم وصححه]. Allah answered: ‘Say, O Musa, La ilaha ilIa-Allah‘. Musa said: ‘O my Rabb, all your slaves say these words’. [This Hadith has been reported by Ibn Hibban, and Al-Hakim declared it Sahih]. This phrase (Ghairy) is the exception from what is in the heavens. It should not be misunderstood that Allah is contained within the heavens or earth since He has described Himself in the Qur’an as the Transcendent, Most High, Above All, i.e. in 2:255, 20:5, 25:59 and many places elsewhere in His Book. Indeed the statement is another proof that Allah cannot be considered within the creation. This ḥadīth was recorded by Ibn Ḥib-bān, al-Ḥākim, an-Nasā’ī in al-Yawm wal-Laylah, aṭ-Ṭabarānī in ad-Du’ā and al-Bayhaqī in al-Asmā’ waṣ-Ṣifāt. Al-Ḥākim graded it ṣaḥīḥ and ath-Thahabī was silent about it, usually indicating his approval. Similarly Ibn Ḥajar graded it ṣaḥīḥ in Fat.ḥ al-Bārī 11:208, it has a slightly different chain of narrators with aṭ-Ṭabarānī and Abū Ya’la about which al-Haythamī said (al-Majma’): “It is recorded by Abū Ya’la and its men are trustworthy, but among them there is some weakness.” Commenting on the chain of Ibn Ḥib-bān, ‘Alūsh (Tashnif al-Athān no. 927) says: “Its chain is weak, Darāj Abū Sumah is weak in his reports from Abū al-Haytham.” Ibn al-Munthir listed Darāj Abū Sumah among the narrators who the ḥadīth scholars differ over saying, “Abū Ḥātim declared him weak, as did ad-Dāraqutnī and others, Aḥmad said, “His ḥadīths are rejected,” an-Nasā’ī said, “Rejected.” Yet others considered him trustworthy like Yahyā b. Ma’īn (it seems that quotes from him are what al-Ḥākim depended upon according to al-Munthirī’s comments in at-Targhīb) and particularly at-Tirmithī in case he reports from Abū al-Haytham (as in this case)! Likewise he was quoted for support by Ibn Khuzaymah. Al-Albānī calls him the possessor and author of munākir (rejected ḥadīths) see al-Dā’īfah 1:294 and 254. Al-Albānī graded it weak in Da’īf al-Mawārid al-Zamān no. 295 , as did Muqbil b. Hādī in al-Mustadrak no. 1988. He said, so how could we enumerate the special virtues of the name of the One Who comprises every perfection unrestrictedly and every praise and commendation and every laudation and exaltation and all splendour and all perfection and all glory and all beauty and all good and all eminence and all generosity, excellence and goodness is for Him and is from Him. So, this name Allaah is not mentioned upon a small amount of something except that it causes it to increase. Nor is it mentioned in a state of fear except that it removes it. Nor is it mentioned upon any misfortune except that it relieves it. Nor in any state of anxiety and distress except that it brings relief. Nor upon any state of difficulty except that it brings ease to it. None who is weak resorts to it except that it brings strength to him. Nor anyone in a state of humiliation except that it brings honour to him. Nor anyone in poverty except that he is enriched. Nor anyone who feels estranged and uneasy except that it causes him to feel at ease. Nor is it mentioned by one who has been overcome except that it brings aid and victory for him. Nor by one who is in straitened circumstances except that his difficulty is removed. Nor is it mentioned by a fugitive except that he finds refuge. So, it is the name, meaning Allaah’s name Allaah, it is the name through which distress is removed through which the descent of blessings is sought and through which supplications are answered. Through it slips are corrected, sins are warded away and good deeds are brought closer. It is the name with which the earth and heavens were established and with which the revealed books were sent down and with which the messengers were sent. With it the legislated laws were prescribed, through it the prescribed punishments were established and with it jihaad was prescribed. Through this name the creation will become divided into the fortunate and the wretched. With it the true and tremendous day is established and with it, the scales of justice are set up, the bridge laid down and the Paradise and the Fire established. With it, the Lord of all creation is worshipped and praised, for its right the messengers were sent and it will be asked about in the grave and for it, there will be the resurrection. Dispute is regarding it and judgement is to it and alliance and enmity are for it. Through it those who know it and establish its rights will be the fortunate ones and through it those who are ignorant of it and leave its rights will be the wretched ones. Then with regard to the name الله Allaah, brief indication of the meaning which is – the One Who is truly venerated and worshipped, the One deserving that He be singled out with all worship because of His perfect attributes of divinity. With regard to the 2nd name that the Shaykh quotes, الأحَد Al-Ahad (the Unique), the One Who is alone and unique in every sense, the One alone in His oneness, in His self and in His attributes, alone in His divinity. The 3rd name; الأعْلَى Al-A’laa (the Most High), the One Who is above everything, having power and control over everything and the One Who is exalted above every deficiency. The 4th name; الأكْرَم Al-Akram (the Most Generous), the One unequalled in His perfect generosity. The 5th name; الإله Al-Ilaah, the One Who alone deserves to be worshipped. The 6th name; الأوَّل Al Awwal (the First) and this name, the 6th and the 7th and the 8th and the 9th Al-Awwalu, W`al Aakhiru W`al Dhaahiru W`al Baatin, the Shaykh has put most of the names as you can see in alphabetical order. These 4 names are out of alphabetical order and put together because they are all explained in an authentic hadeeth in Saheeh Muslim explained by Allaah’s Messenger himself sallAllaahu `alayhi wa sallam. So Al Awwal (the First), is the One Who was before everything without any beginning. The 7th name; الآخِر Al-Aakhir (the Last), the One who remains after everything else without any end. The 8th name; الظاهِر Adh-Dhaahir (the Uppermost One), the One such that nothing is above Him, He is above everything and He encompasses everything with His Knowledge. The 9th name; البَاطِن Al-Baatin (the Innermost One), the One Who encompasses and knows the innermost secrets of everything. The 10th name; البارِئ Al-Baari` (the Originator) the One Who by His power originated and created and fashioned the created beings upon their separate forms without any prior example to follow and Who created and fashioned the souls in the wombs. The 11th name; البَرّ Al-Barr with a baa and a raa and a shaddah on the raa, Al-Barr (the Most Benign and Kind), the One Who treats the creation in an excellent and kind manner, Who does not interrupt His fine treatment of them and Who rectifies their affairs for them. The 12th name; البَصِير Al-Baseer (the All-Seeing), the One Who sees everything such that nothing whatsoever is hidden from Him. The 13th name; التَّوَّاب At-Tawwaab (the One Who guides His servants to repent and accepts their repentance), the One Who guides the servants that they should repent to Him, grants to them that they should repent and accepts their repentance again and again. The 14th name; الجَبَّار Al-Jabbaar (the Exalted and Almighty Compeller), the One to Whose might everything in the creation submits and the exalted One Who rectifies the affairs of His creation for them and Who restores the weak and the broken-hearted. The 15th name; الحافِظ Al-Haafidh (the Protector), the One Who alone guards and protects the heavens and the earth and whatever they contain and Who protects His servants from destruction and from evil. The 16th name; الحَسِيب Al-Haseeb (the Reckoner Who suffices), the One Who preserves the deeds of the creation and will bring them to account for them and the One Who suffices and protects His servants. The 17th name; الحَفِيظ Al-Hafeedh (the Guardian), the One Who protects the servants from harm and Who perfectly preserves whatever deeds His servants have done, not losing any of their deeds and the One Who preserves and protects His beloved servants from falling into sins and from Satan. The 18th name; الحَفِيُّ Al-Hafiyy (the Benevolent), the One Who is ever kind to His servants and ever responding to supplication. The 19th name; الحقّ Al-Haqq (the True One), the One true and certain in His existence in His self, in His attributes, in His sayings and in His actions. The 20th name; المُبِين Al-Mubeen (the Clear and Manifest One), the One Whose sole Lordship and right to worship is clear and manifest. The 21st name; الحَكِيم Al-Hakeem (the All-Wise), the One fully wise in everything He decrees and fully wise in His sayings and in His actions. There is no deficiency or error in anything He decrees, says or does. The 22nd name; الحَلِيم Al-Haleem (the forbearing), the One Who does not immediately punish His servants for their sins, their shirk and their unbelief but rather He gives them the opportunity to repent. The 23rd name; الحَمِيد Al-Hameed (the One Who is deservedly praised), the One Who is praised and fully deserves to be praised for His self, for His perfect names, for His attributes and for His perfect actions. He 24th name; الحَيّ Al-Hayy (the Everliving), the Everliving Who always remains without any beginning and any end with perfect and everlasting life Who never dies nor passes away. The 25th name; القَيُّوم Al-Qayyoom (the Self-Subsisting One), upon Whom everything depends, the One Who sustains everything that exists, the One Who has no need whatever of anything but rather everything in existence has total need of Him. The 26th name; الخَبِير Al-Khabeer (the Fully Aware), the One knowing fully everything that is, has been or will be, knowing whatever will bring harm or benefit, knowing the true condition of everything and the outcome of everything. The 27th name; الخَالِق Al-Khaaliq (the Creator and Maker of everything), the One Who brought everything into existence after it had previously not existed, the One Who has always had the attribute of being the Creator even when there was no creation in existence. The 28th name; الخَلاّق Al Khallaaq (the Creator) who creates again and again, the One for Whom it is not difficult to create anything. The 29th name; الرَّؤُوف Ar-Ra’oof (the Compassionate and Kind), the One Who is kind and compassionate to His servants. The 30th name; الرَّحْمَان Ar-Rahmaan (the Extremely Merciful), the Merciful One Who has as His attribute mercy, the One possessing tremendous and extensive mercy. The 31st name; الرَّحِيم Ar-Raheem (the Bestower of mercy), the One Who has mercy upon the creation. As the verifier has mentioned, the difference between Ar-Rahmaan and Ar-Raheem is Ar-Rahmaan is with regard to the attribute of Allaah’s self, the attribute He has Himself of extreme mercy and Ar-Raheem is His bestowing mercy upon the creation with regard to His action. The 32nd name; الرَّزَّاق Ar-Razzaaq (the Great Provider), the One Who provides extensively for the whole of the creation whatever they need and Who also provides the provision of beneficial knowledge and eemaan for the hearts of His obedient servants indicating the rizq that is general, that which is for the whole creation that He provides whatever the whole creation needs with regard to provision and sustenance and the particular, that which He provides for His beloved servants, the provision in addition to the general provision, the particular provision, the special provision, that of beneficial knowledge and eemaan providing sustenance for the hearts of His believing servants. The 33rd name; الرَّقِيب Ar-Raqeeb (the Ever Watchful Guardian), the One Who misses nothing whatsoever, being aware of all deeds and of whatever thoughts are contained in the hearts of the creation. The 34th name; السّلام As-Salaam (the Impeccable One or Flawless One without any defect), the One free of all imperfections and deficiencies because of His perfection in His self, His attributes and His actions and the One Who renders His creation safe from His punishing anyone who does not deserve punishment and Who renders the creation safe from His oppressing them. The 35th name; السَّمِيع As Samee’ (the All-Hearing), the One Who has as His attribute perfect hearing, the One Who hears everything within the creation even that which is most quiet and secret. The 36th name; الشَاكِر Ash-Shaakir (the Appreciative), the One Who rewards a small deed with a great reward as mentioned by At–Tabaree and Ibn Katheer in their Tafseers in explanation of it. The 37th name; الشَّكُور Ash-Shakoor (the One most ready to appreciate and reward abundantly). The One Who rewards abundantly and multiplies the rewards of His obedient servants for their deeds, deeds which He himself favoured them with, deeds which He Himself granted to them, the One Who does not allow any of their deeds to be lost. The 38th name; الشَّهِيد Ash-Shaheed (the Witness), the One Who witnesses everything, that which is apparent and that which is hidden. The 39th name; الصَّمَد As-Samad (the Perfect Lord and Master upon Whom the whole of creation depends), the Lord and Master Whose control is complete, upon Whom the whole of the creation depends for its needs because of His perfection in His self, His names, His attributes and His actions. The One Who remains and never passes away, the One Who neither eats nor drinks, free of all needs. The 40th name; العَالِم Al-`Aalim (the All-Knower of the seen and the unseen), the Knower of whatever is hidden and whatever is manifest. The 41st name; العَزِيز Al-`Azeez (the Almighty or the Invincible), the Almighty One Whom nothing can overcome, the One mighty in vengeance when He punishes His enemies, the All-Powerful One Who overcomes all and before Whose Might all submit and Who has no need of anyone. The 42nd name; العَظِيم Al-`Adheem (the Tremendous One or the Magnificent), the One tremendous in greatness and the only One deservingly held in awe and venerated by the creation for His greatness in every sense. The 43rd name; العَفُوّ Al-`Afuww with an `ain and a faa and a waaw with a shaddah on it (the One Who pardons again and again), the One Who continues to pardon the sins of His servants and leaves off punishment for them, the One Who pardons His slaves so that they do not suffer the consequences of their sins if they repent. So He knows whatever was, whatever is and whatever will be before it occurs and He knows the true and hidden reality of everything and He knows whatever is not going to be and how it would be if it were to exist and He has always been the All-Knowing, perfect in His knowledge. The 45th name; العَلِيّ Al-`Aliyy (the Exalted), the Exalted One, Exalted in His attributes and His greatness, High Above what the wrongdoers say and the One Who is Himself above the creation ascended upon the Throne and the One Who has ascendancy over the creation by His might. The 3 meanings of Uluw are all affirmed for Allaah; the Uluw of His being exalted and far above what the wrongdoers say, Exalted in His attributes, the One Who is Himself above and is ascended upon the Throne and thirdly, the One Who has ascendancy by His Might over the creation. The 46th name; الغَفَّار Al-Ghaffaar (the Oft-forgiving), the One Who forgives the sins of His servants again and again whenever the servant repents and Who hides the sins of the servants and does not expose them. The 47th name; الغَفُور Al-Ghafoor (the One Who forgives extensively), the One Who covers up the sins of the servant to an extent that cannot even be comprehended and Who forgives them so that He does not punish them for those sins. The 48th name; الغَنِيّ Al-Ghaniyy (the Independent One Who is free of all need), the One Who has no need whatsoever of the creation, the One Who is free from any poverty or need, the One in Whose Hand lie the treasures of the heavens and the earth and of this world and the Hereafter. The 49th name; الفَتَّاح Al-Fattaah, with a faa and a taa with a shaddah on it and a alif and a haa, (the Judge and Opener Who distinguishes the truth from falsehood), the Judge Who judges between His servants with the truth and with justice, with His legislation and with His decree and Who is never unjust and the One Who opens the gates of mercy and provision and whatever is closed to His servants and Who opens the eyes and hearts of His servants for them to see the truth and the One Who aids and grants victory to His believing servants and Who distinguishes the truth from falsehood. And the 50th name; القَادِر Al-Qaadir (the Fully Able One), the One fully able to do anything He wills, nothing renders Him incapable or wearies him. The 51st name; القَاهِر Al-Qaahir (the Invincible Subduer), the One Who subdues His creation from above to Whom everything submits, none can repel what He ordains or depart from what He decrees. The 52nd name; القُدُّوس Al-Quddoos (the Pure and Perfect), the Pure and Exalted One, High Above every impurity, the One Whom the noble angels venerate, the One free of any opposites, rivals, consorts and children, having perfection as His attribute, the One declared free of all deficiencies and imperfections and free of having anyone with the like of His perfection or anyone close to it. The 53rd name; القَدِير Al-Qadeer (the All-Powerful), the One Who is able to do all things, nothing renders Him incapable or wearies Him, the One perfect in His power, the One Who by His power created everything in existence and with His power, He controls them, completes them and gives life and death to them and with His power, He will resurrect His servants and reward and punish them, whenever He wishes something, He says kun (be) and it is. The 54th name; القَرِيب Al-Qareeb (the One Who is near to the servants), He draws nearer to those who perform acts of worship and seek nearness to Him and He is close to their hearts, He is nearer to everyone who makes supplication to Him and also in addition, He is nearer to the people with His knowledge and awareness, witnessing and encompassing everything whilst He is above the Throne; `Arsh. The 55th name; القَوِيّ Al-Qawiyy (the One perfect in strength), the One fully able to do anything, none can overcome Him, none can repel His decrees. The 56th name; القَهَّار Al-Qahhaar (the Overwhelming Subduer Who is never overcome), the One Who alone subdues the whole of the creation with His sovereign authority and power, nothing occurs except with His permission, everything submits to Him, the One Who subdues the most obstinate and renegade tyrants with His punishment and Who subdues the whole of the creation with death. The 57th name; الكَبِير Al-Kabeer (the Incomparably Great), the Tremendous One Who is greater than everything, everything else is insignificant before Him, He is greater than anything imagined by the creation. The 58th name; الكَرِيم Al-Kareem (the Bountiful), the Generous One, abundant in good, the One Who causes and makes easy every good and Who bestows generously, the One so generous that He even bestows favours upon those Who reject His favours and then use them as a means to disobey Him. The 59th name; اللَّطِيف Al-Lateef (the Subtle and Kind), the One Who is fully aware of the hidden details of all affairs and of that which will benefit the servants and Who is kind to them and causes that which is good for them to reach them by a means which they had no expectation of. The 60th name; المُؤمِن Al-Mu`min (the True and Trustworthy), the granter of security, the One Who is true in His words and true to the promise He has made to the servants and Who does not disappoint His believing servants, the One Who safeguards His servants in this world and the Hereafter and Who renders His beloved servants safe from His punishment and Who renders the whole of the creation safe from His oppressing them. The 61st name, المُتَعَالِي Al-Muta’aalee (the Supreme and Exalted One), the One supremely exalted above everything by His power, the One exalted above His creation in His being above them, having power over them and His subduing them, the One High Above and far removed from having anything else like Him and the One free and far removed from the lies of those who invent lies against Him and free from the characteristics of the creation. The 62nd name; المُتَكَبِّر Al-Mutakabbir (the One Supreme in Glory), the justly and rightfully proud, the One Who is alone truly High and Mighty, exalted in glory above everything, the One Who disdains and is exalted above all evil and oppression against His servants and above everything not befitting Him. The 63rd name; المَتِين Al-Mateen (the Strong), the One mighty in strength, the Powerful One whose strength does not end and who does not experience any difficulty in His actions nor does He experience any tiredness. The 64th name; المُجِيب Al-Mujeeb (the Responsive), the One who responds to supplications of those who call upon him wherever they are and whatever situation they are in, no matter how many they are in number and who responds in particular to those who submit to him and those in dire need. The 65th name; المَجِيد Al-Majeed (the One Perfect in Glory and Honour), the One great in honour, the One greatly extolled and praised, the magnificent One, having the characteristics of glory, majesty, greatness and splendour, the One greater, more tremendous and more exalted than everything, the One glorified and venerated in the hearts of His beloved servants. The 66th name; المُحِيط Al-Muheet (the All-Encompassing), the One Who encompasses everything with His power and with His knowledge and has fully enumerated everything and the One Who encompasses everything with His mercy and His subjugation. The 67th name; المُصَوِّر Al-Musawwir (the Bestower of forms), the One Who forms and fashions His creation however He wishes, the One Who gives form to everything in existence, giving each created thing a particular form and appearance, which distinguishes it from all other created things. The 68th name; المُقْتَدِر Al-Muqtadir (the Omnipotent), the One Whose power is absolute, the One for Whom nothing is impossible, He is fully able to do whatever He wishes. The 69th name; المُقِيت Al-Muqeet (the All-Powerful Maintainer), the All-Powerful, the Guardian Who witnesses everything, the One Who provides each created being with the sustenance it requires. The 70th name; المَلِك Al-Malik (the King), the sole, absolute and true Sovereign King, complete and perfect in His Kingship, the One Whom there is no Kingship above His Kingship nor anywhere near it, everything being incomparable to Him and beneath Him, the Sovereign Owner of everything who does whatever He wishes with regard to the creation with nothing to prevent or hinder Him, whose commands are fully effective within His dominion, the king of all kings. The 71st name; المَلِيك Al-Maleek (the Omnipotent Sovereign), the Sovereign Who is fully able to do whatever He wishes, the Tremendous King Who created and decreed everything. The 72nd name; المَولَى Al-Mawlaa (the Patron Lord or the Master and Supporter), the One Who supports and aids the creation, supporting all of them in general and aiding the believers in particular, the Lord and Master who aids the believers against their enemies, the one who causes whatever will benefit His believing servants to reach them. The 73rd name; المُهَيْمِن Al-Muhaymin (the Trustworthy and Ever Watchful Witness), the One Who witnesses all the deeds and sayings of the creation, the One Who sent down His book and is a witness to its truth, the trustworthy One Who confirms the truth of everything He says and the ever watching guardian over His creation. The 75th name; الوَاحِد Al-Waahid (the One and Only), the One Who always has been and always will be One and alone with regard to His self, His dhaat, the One Who has no partner, no sharer and no equal. The 76th name; الوَارِث Al-Waarith (the Inheritor), the One Who remains forever, the One Who remains after everything else perishes, the One Who inherits the earth and everything upon it, the One Who remains forever and never passes away. The 77th name; الوَاسِع Al Waasi’ (the Vast One), the One vast with regard to His attributes and characteristics such that none can fulfil and encompass the praise that is due to Him, the One vast and tremendous in His greatness, His authority and His sovereignty and the One Who encompasses the whole of creation with His generosity, His blessings and with the tremendous good which He grants to them and with His mercy. The 78th name; الوَدُود Al-Wadood (the Loving One and the Beloved One), the One Who loves His believing servants and the One Who is loved by them, the One Who loves His prophets and messengers and their followers and is loved by them such that nothing is more beloved to them than Him. The 79th name; الوَكِيل Al-Wakeel (the Trustworthy Disposer of Affairs), the One Who is depended upon and is true to His promise, the all-encompassing guardian Who suffices those who place their trust and reliance in Him, the One Who takes care of the affairs of His creation with His perfect knowledge and power and so is the finest disposer of their affairs. The 80th name; الوَلِيّ Al-Waliyy (the Guardian Lord), the One Who aids, assists, guides and grants success to the believers, the Guardian, the Master of everything, in control of everything. The 81st name; الوَهَّاب Al-Wahhaab (the Bestower), the One Who bestows His bounties universally and perpetually, giving them freely for no compensation, the One Who gives His bounties throughout the ages to all the inhabitants of the heavens and the earth, the One Who alone grants health, wellbeing and strength, the One Who grants guidance, successful attainment of what is correct; tawfeeq and firmness upon His religion to the believers. The 82nd name; الجَمِيل Al-Jameel (the Beautiful One), the One beautiful in His self, in His names, His attributes and His actions, the One such that everything beautiful in existence is a result and an effect of His beauty, the One so beautiful that when the people of Paradise see Him in Paradise, they forget all the delights and bliss which they enjoy in Paradise because of His beauty, the One perfect in beauty such that nothing is like Him. The 83rd name; الجَوَاد Al-Jawaad (the Munificent), the One Whose generosity covers everything in existence, the One Who gives liberally and generously to those in need even when they reject and disbelieve in Him, the One who from His generosity has prepared in Paradise for His believing servants that which no eye has ever seen, no ear has ever heard of and which has never been imagined by anyone. The 84th name; الحَكَم Al-Hakam (the Judge), the One Who judges between the creation in this world by His revelation and Who judges between them in the Hereafter with His knowledge and Who establishes justice for those who have been wronged by others. The 85th name; الحَيِّي Al-Hayyiyu (the One Who honourably disdains anything unbecoming His mercy and generosity), the One Who honourably disdains to leave the servants who supplicate to Him empty handed, the One Who covers up the sins of the servants and does not expose them, the One Who does not do anything unbecoming His extensive mercy, His perfect generosity and His forbearance, rather He pardons the faults of the servants and covers them. The 86th name; الرَّبّ Ar-Rabb (the Lord and Nurturer) the Lord and Master who has none like Him in His Lordship, the One Who nurtures and rectifies the affairs of the creation by the favours which He showers upon them, the Sovereign Owner Who alone creates and commands, the One Who controls the affairs and grants blessings, the One Who nurtures, the Creator, the Provider, the One Who aids and the One Who guides. The 87th name; الرَّفِيق Ar-Rafeeq (the Gentle), the One Who is gentle with His servants, gentle in His actions having created the creation in stages in accordance with His wisdom and gentleness. The 88th name; السُّبُّوح As-Subbooh (the Venerated and Perfect), the One venerated and declared free of every deficiency, the One Whom the angels venerate. The 89th name; السَّيِّد As-Sayyid (the Lord and Master), the Owner of the whole creation, all of the creation are His slaves, the Lord Whom all of the creation are in total need of. The 90th name; الشَّافِي Ash-Shaafee (the One Who cures), the One Who alone removes from the servants that which causes harm or pain to their hearts and their bodies, the One Who cures whomever He wills such that none can cure except Him. The 91st name; الطَّيِّب At–Tayyib (the Pure One), the One perfect and rightly declared free of all deficiencies and shortcomings. The 92nd name; القابِض Al-Qaabid and the 93rd name; البَاسِط Al-Baasit . It’s befitting that they are mentioned together. Al-Qaabid (the Withholder) and Al-Baasit (the Granter of ample provision). Then with regard to Al-Qaabid; the One Who withholds His provision and other than it from the servants in accordance with His wisdom and subtle kindness and the One Who takes the souls at the point of death and Al-Baasit; the One Who grants ample and extensive provision to His servants and the One Who diffuses the souls of the living in their bodies. The 94th and the 95th name which again it is befitting that they are mentioned together. المُقَدِّم Al-Muqaddim (the One Who gives precedence) and المُؤَخِّر Al-Mu`akhkhir (the One Who puts back).Then with regard to Al-Muqaddim (the One Who gives precedence), the One Who gives precedence to whatever He loves should be given precedence to with regard to their status and their order in accordance with His wisdom and Al-Mu`akhkhir; the One Who puts back whatever He wishes, putting back whatever wisdom and rectitude necessitates should be put back. The 96th name; المُحْسِن Al-Muhsin, the One Who acts in a good and fine manner, the One such that all His actions are perfect. The 97th name; المُعْطِي Al Mu’tee (the Giver), the One Who gives to whomever it is fitting should be given. The 98th name; المَنَّان Al-Mannaan (the Beneficent Bestower of bounties), the One such that all favours and blessings originate from Him, He is the One Who granted them and favoured the creation with them. The 99th name; الوِتْر Al-Witr (the One Who has no partner nor anyone like Him), He Who is One in His self, One in His attributes, One in His actions, having no partner and no helper, Subhaanahu Wata’ala. Reported by Muslim from the hadeeth of A’ishah radiyAllaahu `anha. Audio lessons are by Abu Talhah rahimahullaah, mainly based upon Imam AbdurRahman Al-Sadi’s explanation, which can be bought here and used as study aid while listening to the series. In addition, Dawud Burbank rahimahullaah also explains some Points from Shaykh Uthaymeen and other Imaams as well. This book is a brief yet extremely beneficial explanation of Sheikh al-Islam Muhammad ibn Abd al-Wahhab’s famous Kitab al-Tawhid. The book, as the title suggests, deals with the subject of worshipping Allah alone without associating partners with Him. The author highlights many matters that have become common among Muslims even though they are clearly acts of shirk or associating partners with Allah. Not only is this book distinguished due to the importance of the subject matter but also due to the methodology adopted by the author for which he is well known. The reader will find that the majority of the book consists of verses of the Qur’an, ahadith of the Prophet (صلى الله عليه وسلم) and sayings of the early Muslims. The explanation presented at the end of each chapter of Kitab al-Tawhid is that of the renowned scholar Allamah Abd al-Rahman al-Sa di, counted among the major scholars of recent times. He was born in al-Qasim, Saudi Arabia, in the year 1307AH, and from a young age became engrossed in the attainment of knowledge. His dedication and thirst for knowledge led him to become an authority in many of the Islamic sciences as is evident from the books that he authored. He passed away in the year 1376 AH, may Allah have mercy on him. Posted with kind permission from Dawud Burbank rahimahullaah . This is the weekly Saturday morning class on the book Al-Mulakhas fee Sharh Kitaabit-Tawheed (Concise Commentary on the Book of Tawhid) by Shaykh Saalih al-Fawzaan. As with all of our classes at Masjid Tawheed in Stone Mountain, GA, we encourage you to join us. If you are not able to attend in person, please feel free to listen in via our Spreaker channel or our telelink line at 712-432-2856. This book gives a clear explanation of the Muslim sound Creed which is the core of the religion of Islam, as the belief in Tawhid (monotheism) is the purpose for which Allah created both mankind and jinn, and thus, those whose belief in Tawhid is corrupt, are not considered Muslims. 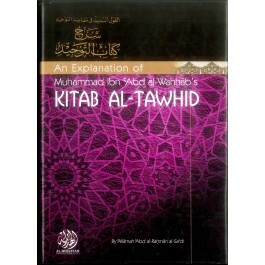 It is a commentary on the Book of Tawhid written by Sheikh Muhammad Ibn Abdul Wahhab. In this book, Dr. Salih al Fawzan has projected light on doctrinal issues of utmost importance in a genuine and reader-friendly style. This translated version of the book fulfills a long-standing need on the part of English-speaking Muslims for a brief, introductory book in Tawhid. It is a valuable book for novice readers, be they Muslims or non-Muslims, who do not have thorough knowledge of the sound creed, The chapters of this book focus on major issues in Tawhid such as the definition of Tawhid, virtue of Tawhid, warning against acts of shirk (polytheism), the Prophet’s Maintenance of monotheism, and other topics. These were lessons conducted on the book ‘al-Qawl-ul- Mufeed Fee Adillatit-Tawhid’ [Beneficial Speech in Establishing the Evidences of Tawhid] written by one of the major scholars of the Sunnah in Yemen, Shaikh Muhammad ibn Abdul-Wahhab al-Wasabi (may Allah preserve him). They were explained live via a telephone conference calling system by the Imam of the Masjid in Dar-ul-Hadith, Dammaj (Yemen), who is one of the senior scholars of the center of learning in Dammaj, Shaikh Ahmad al-Wasabi (may Allah preserve him). These lessons were conducted every Saturday from the period of April 2005 to June 2006. The .pdf files also contain questions which were asked in relation to the topic of the lesson in question. Is the Astrologer a Magician? Is the Magician a Disbeliever?